Did you know that jello shots are starting to make a comeback? 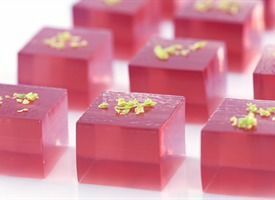 Jello Shots are pretty easy to make but do require some planning and patience. We also love how beautiful jello shots look and we also admit we like the way they taste! We made this recipe for a special bride this past fall and recommend using the fresh lime juice. I always think fresh juices make all the difference in a recipe. Pour cranberry and lime juices into a small saucepan and sprinkle with gelatin. Allow to soak for a few minutes. Heat on low, stirring constantly, until gelatin is fully dissolved (about 5 minutes). Stir in the liquors, making sure to fully incorporate. Pour into pan or molds, and chill until set, several hours or overnight. To serve, cut into desired shapes and garnish with lime zest, if desired.